The respondent update is the function of the integration Connector responsible for updating the respondent (contact or lead) information. It refers to the Survey mappings to identify which contact or lead field update with each question answer. Before creating a Survey Response the integration Connector searches for the respondent using the e-mail address submitted in the Survey. If it finds a contact or lead with the same e-mail address it creates a Survey Response activity and updates the respondent fields mapped in the Survey with the answers submitted by the respondent. By turning the Respondent Update off the integration Connector will skip the update step. Why should I turn it off? Having your contacts’ data automatically updated with their answers is very tempting as it might sound as an easy way of having your database updated. However, information updated through public forms can be very risky to your data quality as it could be accessed by anyone who has the page address (a contact could forward to a friend your event invitation for example). Unless you have a data management tool, we recommend to have the Respondent Update off to avoid any risk of data contamination. 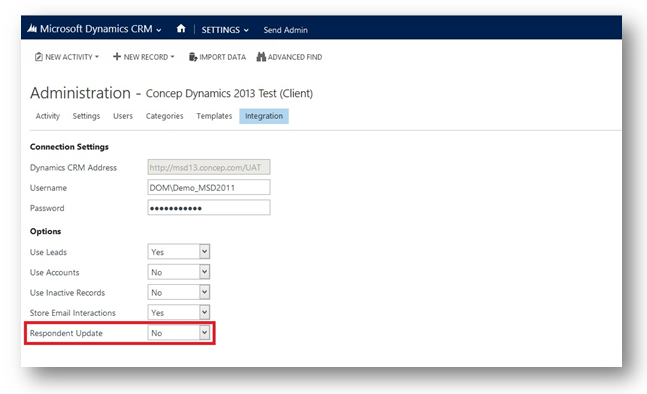 To be able to turn it off you need to have the Email Marketing Administrator security role and the Admin Send Account assigned to your Microsoft Dynamics CRM user. The Respondent Update configuration is located in the Integration tab of the Send Admin page in Settings. The Respondent Update configuration is located at the bottom of the page. Switch to “No” and click on save. It will be automatically added to your integration Connector configuration and used next time it runs. What are the different Drag and Drop content areas?